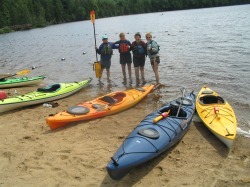 There is no better time to discover kayaking, learn how with Placid Waters Kayaking. Paddling season is here!! The season has arrived a bit early but water temps are still cold so paddle safely and with proper gear. Please call to check space availability and reserve a spot. This is a 6 hour course designed for beginner to intermediate level paddlers who want to learn skill development and safety. Instructors focus on techniques that will improve your skills and teach you the essentials needed for solo or group paddling. Content to be covered will include an understanding of all equipment including kayak, paddle, life jacket and safety gear. Strokes to be covered include the forward, back, sweep, sculling and rudder. You will learn how to maneuver your kayak efficiently as well as learn and practice several rescues techniques and yes you will have to do the "wet exit". It's also important to know how to load and unload your kayak from your vehicle. Being safe on the water comes first and with the proper instruction and practice you will not only be safe but you will become a better paddler which means you will enjoy it more. having fun is also an important part of the class! Please join us on the water. 6 hour course, $129 includes kayak, gear and lunch. This is the perfect 3 hour class for those interested in making their first kayak purchase and those who consider themselves to be a beginner needing some basic skills and safety knowledge. This class is designed to enhance your enjoyment on the water by increasing your comfort and confidence levels. Content will cover equipment and usage, basic paddling strokes and safety. 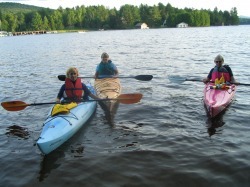 Class is appropriate for recreational and day touring paddlers. Private/Customized classes are available and designed to fit your need. $45 per hour.